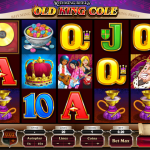 Rhyming Reels Old King Cole is a video slot game from Microgaming that is part of the Rhyming Reels series. Judging from the symbols our old King leads pretty amazing life so for a moment you are given the chance to join him. Enjoy the riches that he has and if you can try to take it away, after all you are in for the win, right? In the background you will hear an old nursery rhyme that will put you in the right mood to play the game. 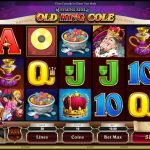 Rhyming Reels Old King Cole is powered with free spins feature. So, let’s see how we can get there. First things first, there are some important symbols in this game, the wilds and the scatter that can bring smile to our face. We have 2 wild symbols here, the game’s logo and the gold disc. Both this symbols have the same function they substitute for every other symbol except for the scatter to complete a winning line. The game’s logo is the wild during the whole game, while the gold disc is seen during the free spins only. The crown is the scatter and also the key that activates the free spins. Landing 3, 4 or 5 scatter symbols will bring you 12 free spins and the good news is that the feature can be re-triggered too. Rhyming Reels Old King Cole can bring smiles to your face for sure and that was Microgaming’s primary intention. The game is interesting and you will have fun from the beginning until the end of your game session. This is one of those slots that can be played all year round and if you haven’t tried it yet then we advise you to do so. If you’re a fan of the Greek mythology then consider playing Stash Of The Titans a 5 reel slot by MicroGaming.